This article applies to version 1 of Data Factory. If you are using the current version of the Data Factory service, see self-hosted integration runtime in. Data Management Gateway has now been rebranded as Self-hosted Integration Runtime. The Data management gateway is a client agent that you must install in your on-premises environment to copy data between cloud and on-premises data stores. The on-premises data stores supported by Data Factory are listed in the Supported data sources section. This article complements the walkthrough in the Move data between on-premises and cloud data stores article. In the walkthrough, you create a pipeline that uses the gateway to move data from an on-premises SQL Server database to an Azure blob. This article provides detailed in-depth information about the data management gateway. You can scale out a data management gateway by associating multiple on-premises machines with the gateway. You can scale up by increasing number of data movement jobs that can run concurrently on a node. This feature is also available for a logical gateway with a single node. 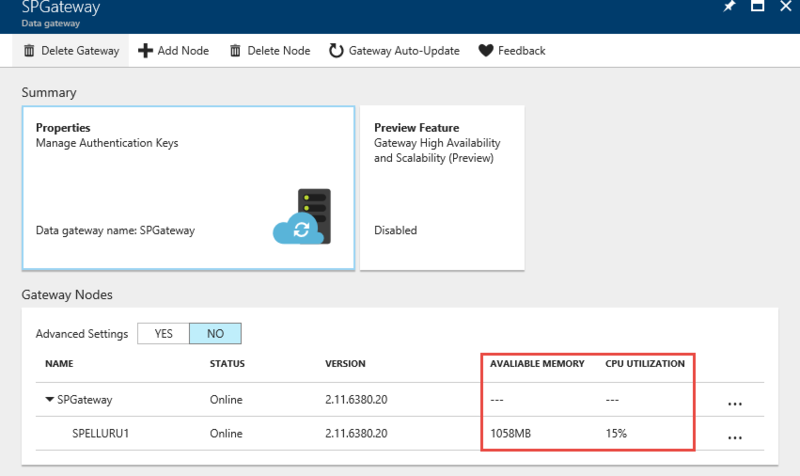 See Scaling data management gateway in Azure Data Factory article for details. Currently, gateway supports only the copy activity and stored procedure activity in Data Factory. It is not possible to use the gateway from a custom activity to access on-premises data sources. Model on-premises data sources and cloud data sources within the same data factory and move data. Have a single pane of glass for monitoring and management with visibility into gateway status from the Data Factory page. Manage access to on-premises data sources securely. No changes required to corporate firewall. Gateway only makes outbound HTTP-based connections to open internet. Encrypt credentials for your on-premises data stores with your certificate. Move data efficiently - data is transferred in parallel, resilient to intermittent network issues with auto retry logic. When you use a copy activity to copy data between on-premises and cloud, the activity uses a gateway to transfer data from on-premises data source to cloud and vice versa. Data developer creates a gateway for an Azure Data Factory using either the Azure portal or PowerShell Cmdlet. Data developer creates a linked service for an on-premises data store by specifying the gateway. As part of setting up the linked service, data developer uses the Setting Credentials application to specify authentication types and credentials. The Setting Credentials application dialog communicates with the data store to test connection and the gateway to save credentials. Gateway encrypts the credentials with the certificate associated with the gateway (supplied by data developer), before saving the credentials in the cloud. 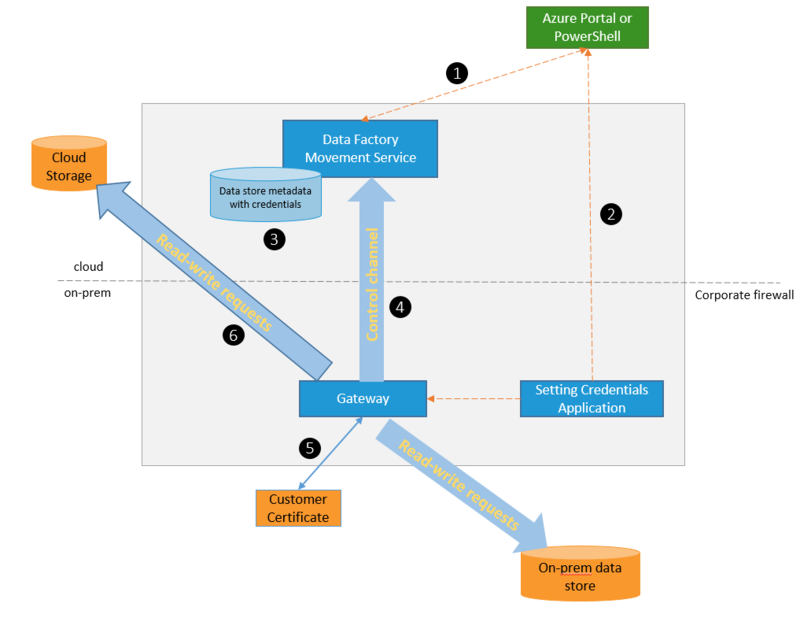 Data Factory service communicates with the gateway for scheduling & management of jobs via a control channel that uses a shared Azure service bus queue. When a copy activity job needs to be kicked off, Data Factory queues the request along with credential information. Gateway kicks off the job after polling the queue. The gateway decrypts the credentials with the same certificate and then connects to the on-premises data store with proper authentication type and credentials. The gateway copies data from an on-premises store to a cloud storage, or vice versa depending on how the Copy Activity is configured in the data pipeline. For this step, the gateway directly communicates with cloud-based storage services such as Azure Blob Storage over a secure (HTTPS) channel. A single instance of data management gateway can be used for multiple on-premises data sources. However, a single gateway instance is tied to only one Azure data factory and cannot be shared with another data factory. The gateway does not need to be on the same machine as the data source. However, having gateway closer to the data source reduces the time for the gateway to connect to the data source. We recommend that you install the gateway on a machine that is different from the one that hosts on-premises data source. When the gateway and data source are on different machines, the gateway does not compete for resources with data source. You can have multiple gateways on different machines connecting to the same on-premises data source. For example, you may have two gateways serving two data factories but the same on-premises data source is registered with both the data factories. 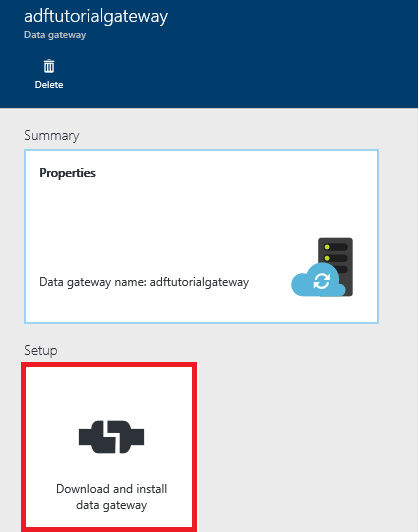 If you already have a gateway installed on your computer serving a Power BI scenario, install a separate gateway for Azure Data Factory on another machine. Gateway must be used even when you use ExpressRoute. Treat your data source as an on-premises data source (that is behind a firewall) even when you use ExpressRoute. Use the gateway to establish connectivity between the service and the data source. 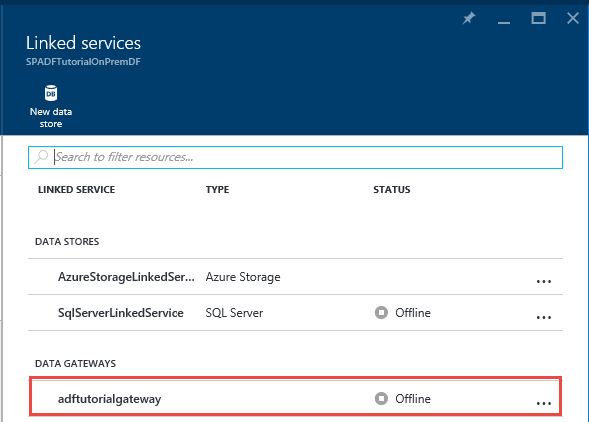 You must use the gateway even if the data store is in the cloud on an Azure IaaS VM. The supported Operating System versions are Windows 7, Windows 8/8.1, Windows 10, Windows Server 2008 R2, Windows Server 2012, Windows Server 2012 R2. Installation of the data management gateway on a domain controller is currently not supported. .NET Framework 4.5.1 or above is required. If you are installing gateway on a Windows 7 machine, install .NET Framework 4.5 or later. See .NET Framework System Requirements for details. The recommended configuration for the gateway machine is at least 2 GHz, 4 cores, 8-GB RAM, and 80-GB disk. If the host machine hibernates, the gateway does not respond to data requests. Therefore, configure an appropriate power plan on the computer before installing the gateway. If the machine is configured to hibernate, the gateway installation prompts a message. You must be an administrator on the machine to install and configure the data management gateway successfully. You can add additional users to the data management gateway Users local Windows group. The members of this group are able to use the Data Management Gateway Configuration Manager tool to configure the gateway. As copy activity runs happen on a specific frequency, the resource usage (CPU, memory) on the machine also follows the same pattern with peak and idle times. Resource utilization also depends heavily on the amount of data being moved. When multiple copy jobs are in progress, you see resource usage go up during peak times. By downloading an MSI setup package from the Microsoft Download Center. The MSI can also be used to upgrade existing data management gateway to the latest version, with all settings preserved. By clicking Download and install data gateway link under MANUAL SETUP or Install directly on this computer under EXPRESS SETUP. 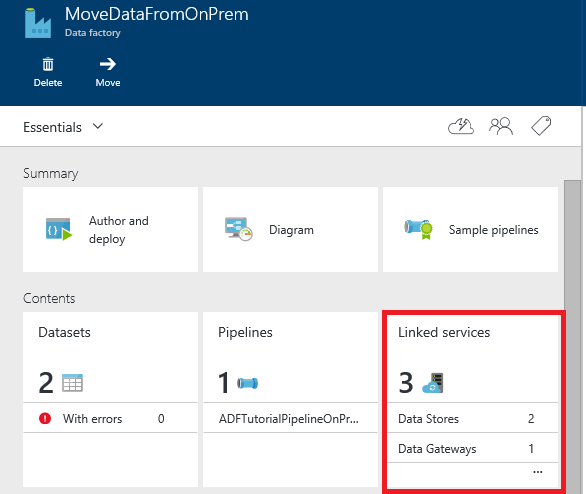 See Move data between on-premises and cloud article for step-by-step instructions on using express setup. The manual step takes you to the download center. The instructions for downloading and installing the gateway from download center are in the next section. Configure power plan on the host machine for the gateway so that the machine does not hibernate. If the host machine hibernates, the gateway does not respond to data requests. Back up the certificate associated with the gateway. 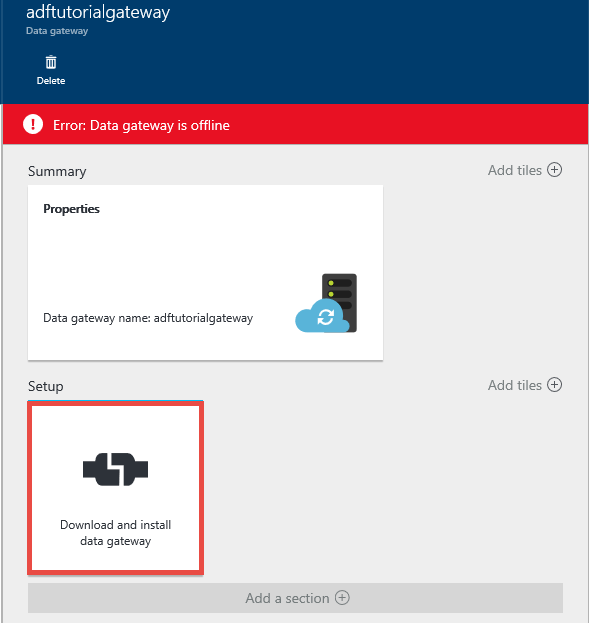 Navigate to Microsoft Data Management Gateway download page. Click Download, select the 64-bit version (32-bit is no more supported), and click Next. Run the MSI directly or save it to your hard disk and run. On the Welcome page, select a language click Next. Select folder to install the gateway and click Next. Get the key from the Azure portal. See the next section for step-by-step instructions. Paste the key in the text. Optionally, click Show gateway key to see the key text. 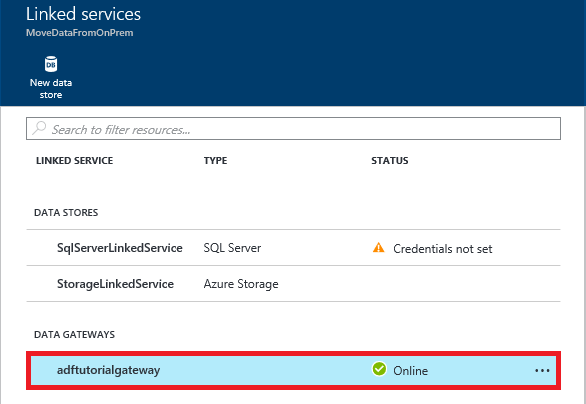 To create a gateway in the portal and get the key from the Configure page, Follow steps from walkthrough in the Move data between on-premises and cloud article. 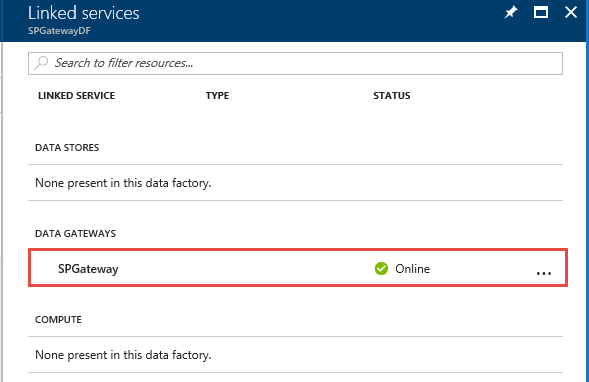 In Azure portal, navigate to the Data Factory page, and click Linked Services tile. In the Linked Services page, select the logical gateway you created in the portal. In the Data Gateway page, click Download and install data gateway. In the Configure page, click Recreate key. Click Yes on the warning message after reading it carefully. Click Copy button next to the key. The key is copied to the clipboard. The following image shows some of the tray icons that you see. If you move cursor over the system tray icon/notification message, you see details about the state of the gateway/update operation in a popup window. There are two firewalls you need to consider: corporate firewall running on the central router of the organization, and Windows firewall configured as a daemon on the local machine where the gateway is installed. At Windows firewall level, these outbound ports are normally enabled. If not, you can configure the domains and ports accordingly on gateway machine. Based on your source/ sinks, you may have to whitelist additional domains and outbound ports in your corporate/Windows firewall. For some Cloud Databases (For example: Azure SQL Database, Azure Data Lake, etc. ), you may need to whitelist IP address of Gateway machine on their firewall configuration. Ensure that the firewall rules are enabled properly on the corporate firewall, Windows firewall on the gateway machine, and the data store itself. Enabling these rules allows the gateway to connect to both source and sink successfully. Enable rules for each data store that is involved in the copy operation. Configure the firewall settings of Azure SQL server to add the IP address of the gateway machine to the list of allowed IP addresses. If your firewall does not allow outbound port 1433, Gateway can't access Azure SQL directly. In this case, you may use Staged Copy to SQL Azure Database/ SQL Azure DW. In this scenario, you would only require HTTPS (port 443) for the data movement. 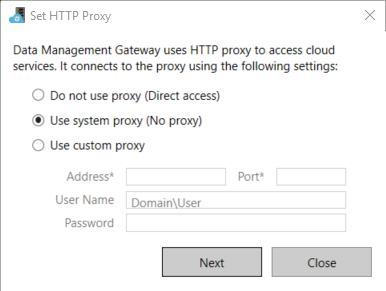 If your corporate network environment uses a proxy server to access the internet, configure data management gateway to use appropriate proxy settings. You can set the proxy during the initial registration phase. Gateway uses the proxy server to connect to the cloud service. Click Change link during initial setup. You see the proxy setting dialog. Do not use proxy: Gateway does not explicitly use any proxy to connect to cloud services. Use system proxy: Gateway uses the proxy setting that is configured in diahost.exe.config and diawp.exe.config. 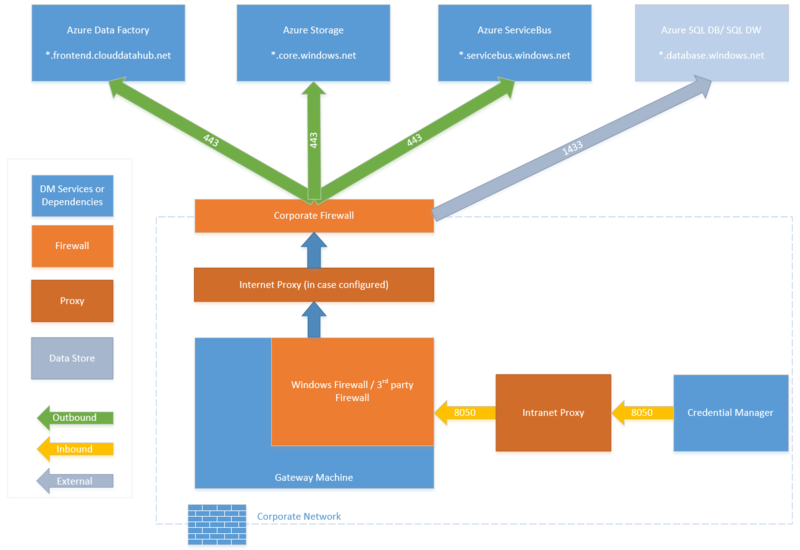 If no proxy is configured in diahost.exe.config and diawp.exe.config, gateway connects to cloud service directly without going through proxy. Use custom proxy: Configure the HTTP proxy setting to use for gateway, instead of using configurations in diahost.exe.config and diawp.exe.config. Address and Port are required. User Name and Password are optional depending on your proxy's authentication setting. All settings are encrypted with the credential certificate of the gateway and stored locally on the gateway host machine. 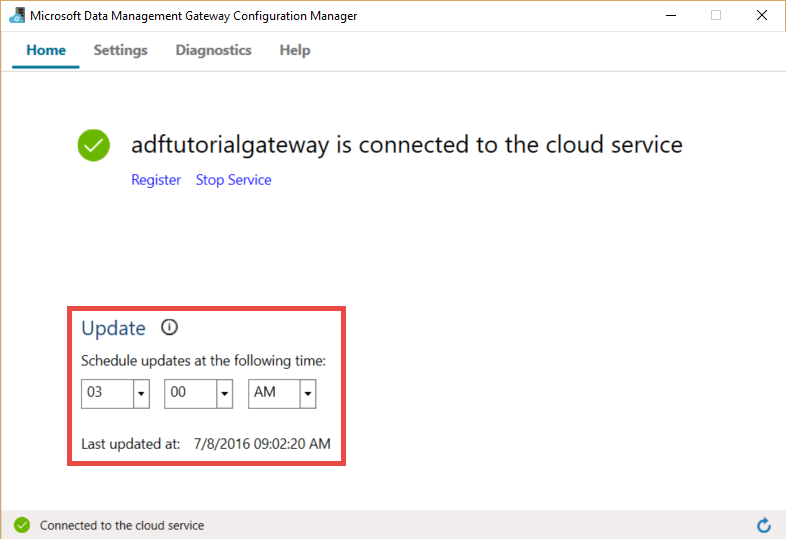 The data management gateway Host Service restarts automatically after you save the updated proxy settings. 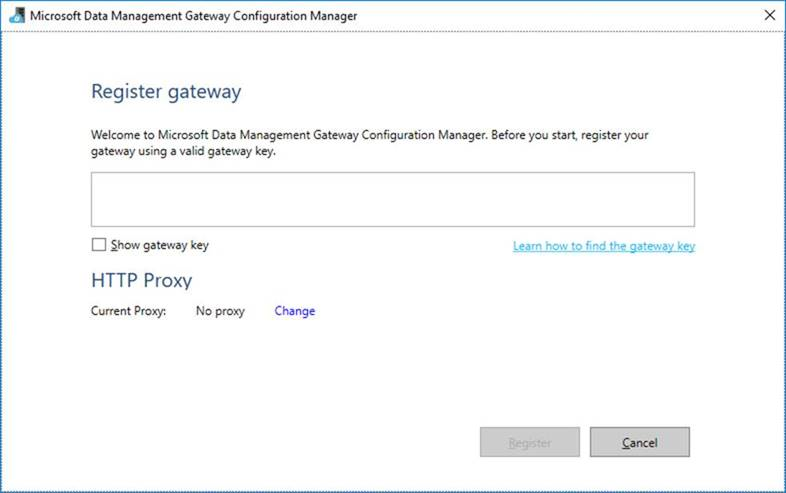 After gateway has been successfully registered, if you want to view or update proxy settings, use Data Management Gateway Configuration Manager. Launch Data Management Gateway Configuration Manager. Click Change link in HTTP Proxy section to launch the Set HTTP Proxy dialog. After you click the Next button, you see a warning dialog asking for your permission to save the proxy setting and restart the Gateway Host Service. You can view and update HTTP proxy by using Configuration Manager tool. If you set up a proxy server with NTLM authentication, Gateway Host Service runs under the domain account. If you change the password for the domain account later, remember to update configuration settings for the service and restart it accordingly. Due to this requirement, we suggest you use a dedicated domain account to access the proxy server that does not require you to update the password frequently. If you select Use system proxy setting for the HTTP proxy, gateway uses the proxy setting in diahost.exe.config and diawp.exe.config. 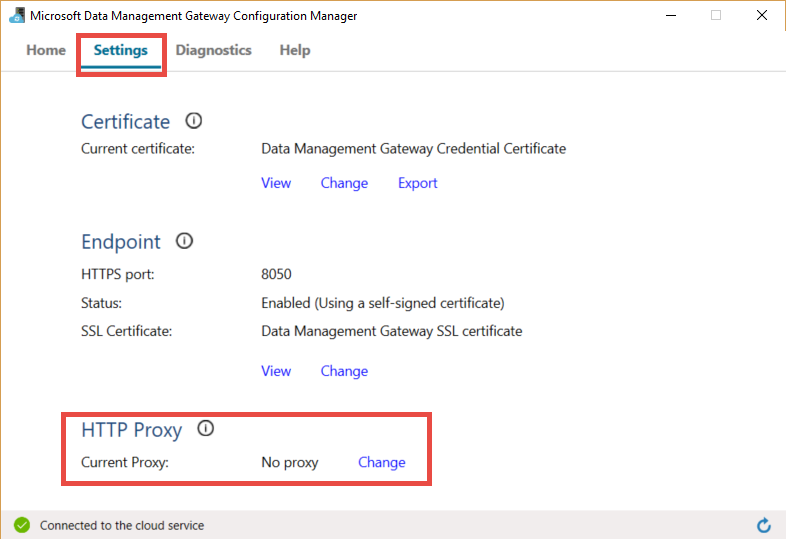 If no proxy is specified in diahost.exe.config and diawp.exe.config, gateway connects to cloud service directly without going through proxy. The following procedure provides instructions for updating the diahost.exe.config file. In File Explorer, make a safe copy of C:\Program Files\Microsoft Data Management Gateway\2.0\Shared\diahost.exe.config to back up the original file. Additional properties are allowed inside the proxy tag to specify the required settings like scriptLocation. Refer to proxy Element (Network Settings) on syntax. Save the configuration file into the original location, then restart the Data Management Gateway Host service, which picks up the changes. To restart the service: use services applet from the control panel, or from the Data Management Gateway Configuration Manager > click the Stop Service button, then click the Start Service. If the service does not start, it is likely that an incorrect XML tag syntax has been added into the application configuration file that was edited. Do not forget to update both diahost.exe.config and diawp.exe.config. In addition to these points, you also need to make sure Microsoft Azure is in your company's whitelist. The list of valid Microsoft Azure IP addresses can be downloaded from the Microsoft Download Center. If you encounter errors similar to the following ones, it is likely due to improper configuration of the firewall or proxy server, which blocks gateway from connecting to Data Factory to authenticate itself. Refer to previous section to ensure your firewall and proxy server are properly configured. When you try to register the gateway, you receive the following error: "Failed to register the gateway key. 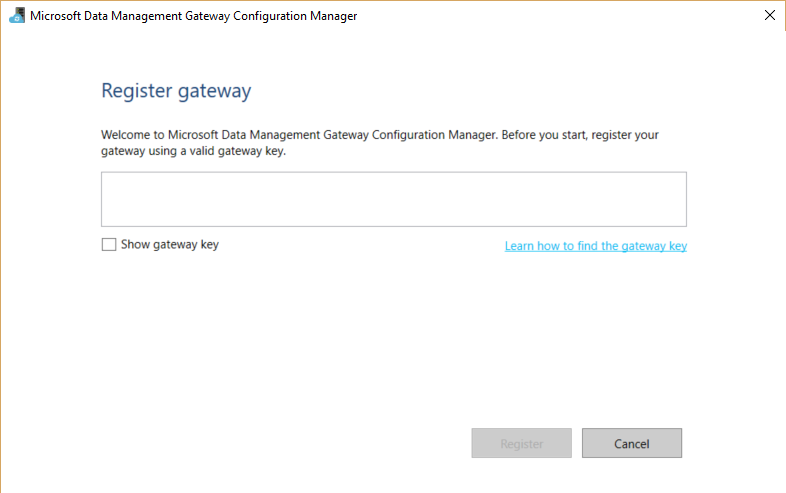 Before trying to register the gateway key again, confirm that the data management gateway is in a connected state and the Data Management Gateway Host Service is Started." When you open Configuration Manager, you see status as "Disconnected" or "Connecting." When viewing Windows event logs, under "Event Viewer" > "Application and Services Logs" > "Data Management Gateway", you see error messages such as the following error: Unable to connect to the remote server A component of Data Management Gateway has become unresponsive and restarts automatically. Component name: Gateway. 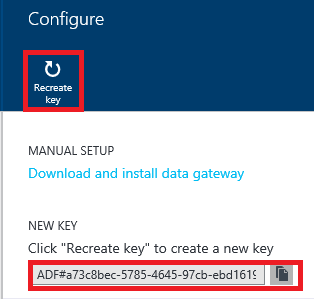 The Setting Credentials application uses the inbound port 8050 to relay credentials to the gateway when you set up an on-premises linked service in the Azure portal. During gateway setup, by default, the gateway installation opens it on the gateway machine. If you are using a third-party firewall, you can manually open the port 8050. If you run into firewall issue during gateway setup, you can try using the following command to install the gateway without configuring the firewall. 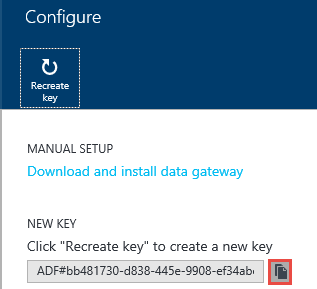 If you choose not to open the port 8050 on the gateway machine, use mechanisms other than using the Setting Credentials application to configure data store credentials. For example, you could use New-AzDataFactoryEncryptValue PowerShell cmdlet. See Setting Credentials and Security section on how data store credentials can be set. By default, data management gateway is automatically updated when a newer version of the gateway is available. The gateway is not updated until all the scheduled tasks are done. No further tasks are processed by the gateway until the update operation is completed. If the update fails, gateway is rolled back to the old version. The gateway properties page in the Azure portal. The Home tab of the Data Management Gateway Configuration Manager displays the update schedule and the last time the gateway was installed/updated. You can install the update right away or wait for the gateway to be automatically updated at the scheduled time. For example, the following image shows you the notification message shown in the Gateway Configuration Manager along with the Update button that you can click to install it immediately. You see the status of update operation (manual or automatic) in the system tray. When you launch Gateway Configuration Manager next time, you see a message on the notification bar that the gateway has been updated along with a link to what's new topic. Launch Windows PowerShell on the gateway machine. Switch to the C:\Program Files\Microsoft Integration Runtime\3.0\PowerShellScript\ folder. Run the following command to turn the auto-update feature OFF (disable). For gateway with high availability feature, an extra AuthKey param is required. In the Search window, type Data Management Gateway to access this utility. View status of the gateway (connected to the cloud service etc.). Register using a key from the portal. Stop and start the Data Management Gateway Host service on the gateway machine. Schedule updates at a specific time of the days. 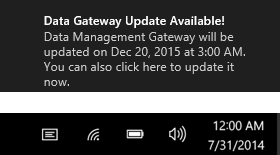 View the date when the gateway was last updated. View, change, and export certificate used by the gateway. This certificate is used to encrypt data source credentials. Change HTTPS port for the endpoint. The gateway opens a port for setting the data source credentials. View SSL certificate is used for SSL communication between portal and the gateway to set credentials for data sources. This functionality will be enabled in the future. In the upcoming updates (v3.4 or later) we will let you enable/ disable any remote connectivity that today happens using port 8050 (see section above) while using PowerShell or Credential Manager application for encrypting credentials. Enable verbose logging, view logs in event viewer, and send logs to Microsoft if there was a failure. Test connection to a data source. Links to online help, privacy statement, and license agreement. In the Azure portal, you can view near-real time snapshot of resource utilization (CPU, memory, network(in/out), etc.) on a gateway machine. 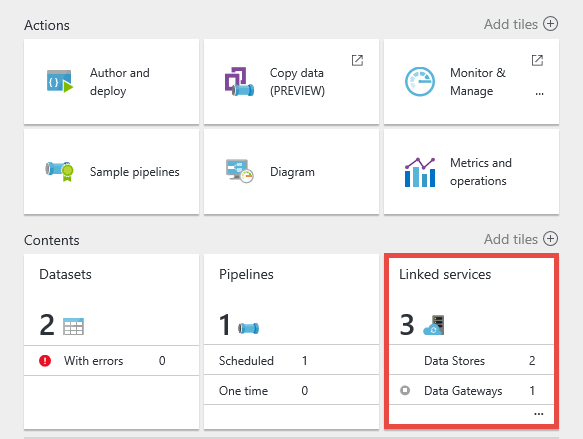 In Azure portal, navigate to the home page for your data factory, and click Linked services tile. Select the gateway in the Linked services page. In the Gateway page, you can see the memory and CPU usage of the gateway. Enable Advanced settings to see more details such as network usage. Name Name of the logical gateway and nodes associated with the gateway. Node is an on-premises Windows machine that has the gateway installed on it. For information on having more than one node (up to four nodes) in a single logical gateway, see Data Management Gateway - high availability and scalability. Status Status of the logical gateway and the gateway nodes. Example: Online/Offline/Limited/etc. For information about these statuses, See Gateway status section. Version Shows the version of the logical gateway and each gateway node. The version of the logical gateway is determined based on version of majority of nodes in the group. If there are nodes with different versions in the logical gateway setup, only the nodes with the same version number as the logical gateway function properly. Others are in the limited mode and need to be manually updated (only in case auto-update fails). Available memory Available memory on a gateway node. This value is a near real-time snapshot. CPU utilization CPU utilization of a gateway node. This value is a near real-time snapshot. Networking (In/Out) Network utilization of a gateway node. This value is a near real-time snapshot. Concurrent Jobs (Running/ Limit) Number of jobs or tasks running on each node. This value is a near real-time snapshot. Limit signifies the maximum concurrent jobs for each node. This value is defined based on the machine size. You can increase the limit to scale up concurrent job execution in advanced scenarios, where CPU/memory/network is under-utilized, but activities are timing out. This capability is also available with a single-node gateway (even when the scalability and availability feature is not enabled). Role There are two types of roles in a multi-node gateway - Dispatcher and worker. All nodes are workers, which means they can all be used to execute jobs. There is only one dispatcher node, which is used to pull tasks/jobs from cloud services and dispatch them to different worker nodes (including itself). In this page, you see some settings that make more sense when there are two or more nodes (scale out scenario) in the gateway. See Data Management Gateway - high availability and scalability for details about setting up a multi-node gateway. Online Node connected to Data Factory service. Upgrading The node is being auto-updated. Limited Due to Connectivity issue. May be due to HTTP port 8050 issue, service bus connectivity issue, or credential sync issue. Inactive Node is in a configuration different from the configuration of other majority nodes. A node can be inactive when it cannot connect to other nodes. The following table provides possible statuses of a logical gateway. The gateway status depends on statuses of the gateway nodes. Offline No node in online status. Limited Not all nodes in this gateway are in healthy state. This status is a warning that some node might be down! Could be due to credential sync issue on dispatcher/worker node. You can configure the number of concurrent data movement jobs that can run on a node to scale up the capability of moving data between on-premises and cloud data stores. When the available memory and CPU are not utilized well, but the idle capacity is 0, you should scale up by increasing the number of concurrent jobs that can run on a node. You may also want to scale up when activities are timing out because the gateway is overloaded. In the advanced settings of a gateway node, you can increase the maximum capacity for a node. See Troubleshooting gateway issues article for information/tips for troubleshooting issues with using the data management gateway. This section provides steps for moving gateway client from one machine to another machine. 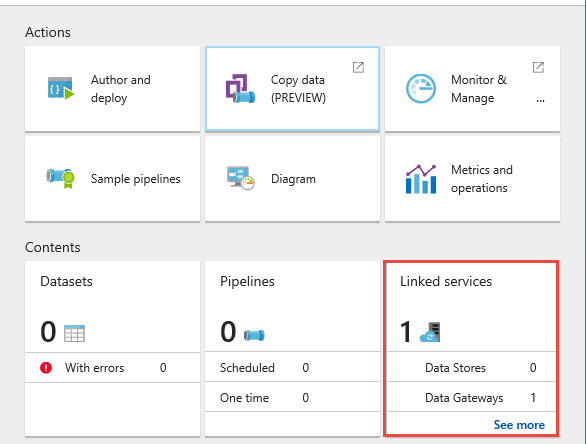 In the portal, navigate to the Data Factory home page, and click the Linked Services tile. Select your gateway in the DATA GATEWAYS section of the Linked Services page. 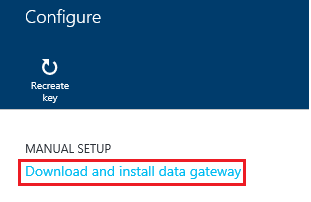 In the Configure page, click Download and install data gateway, and follow instructions to install the data gateway on the machine. Keep the Microsoft Data Management Gateway Configuration Manager open. In the Configure page in the portal, click Recreate key on the command bar, and click Yes for the warning message. Click copy button next to key text that copies the key to the clipboard. The gateway on the old machine stops functioning as soon you recreate the key. 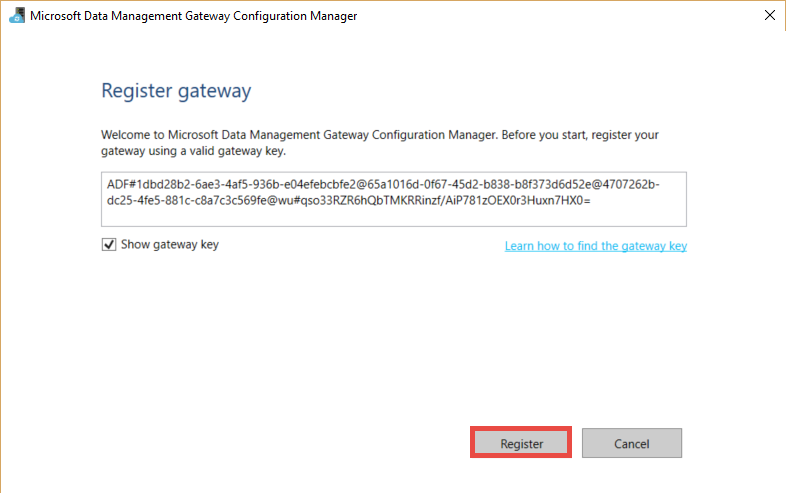 Paste the key into text box in the Register Gateway page of the Data Management Gateway Configuration Manager on your machine. (optional) Click Show gateway key check box to see the key text. Click Register to register the gateway with the cloud service. On the Settings tab, click Change to select the same certificate that was used with the old gateway, enter the password, and click Finish. 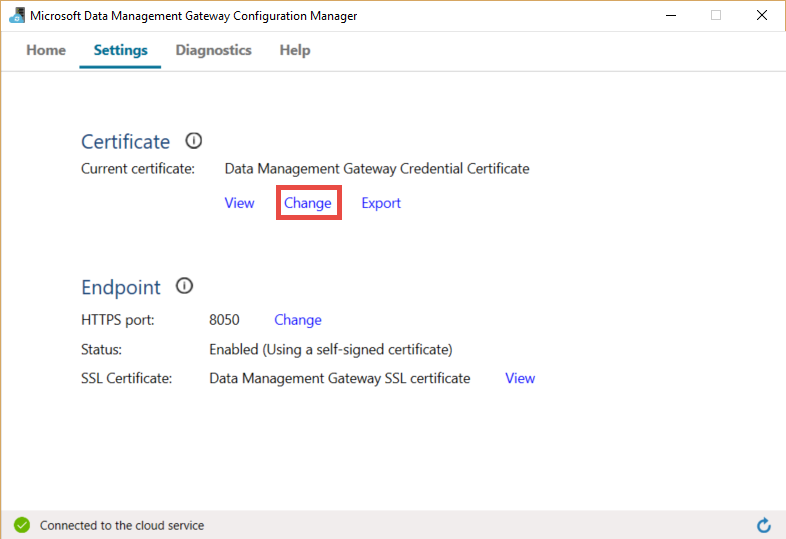 You can export a certificate from the old gateway by doing the following steps: launch Data Management Gateway Configuration Manager on the old machine, switch to the Certificate tab, click Export button and follow the instructions. After successful registration of the gateway, you should see the Registration set to Registered and Status set to Started on the Home page of the Gateway Configuration Manager. Launch web browser on the gateway machine, navigate to Azure portal. Search for your data factory if needed, open data factory in the DATA FACTORY page and then click Author & Deploy to launch Data Factory Editor. Click an existing linked service in the tree view to see its JSON definition or create a linked service that requires a data management gateway (for example: SQL Server or Oracle). In the JSON editor, for the gatewayName property, enter the name of the gateway. Enter server name for the Data Source property in the connectionString. Enter database name for the Initial Catalog property in the connectionString. Click Encrypt button on the command bar that launches the click-once Credential Manager application. You should see the Setting Credentials dialog box. Select authentication that you want the Data Factory service to use to connect to the database. Enter name of the user who has access to the database for the USERNAME setting. Enter password for the user for the PASSWORD setting. Click OK to encrypt credentials and close the dialog box. You should see a encryptedCredential property in the connectionString now. If you access the portal from a machine that is different from the gateway machine, you must make sure that the Credentials Manager application can connect to the gateway machine. If the application cannot reach the gateway machine, it does not allow you to set credentials for the data source and to test connection to the data source. 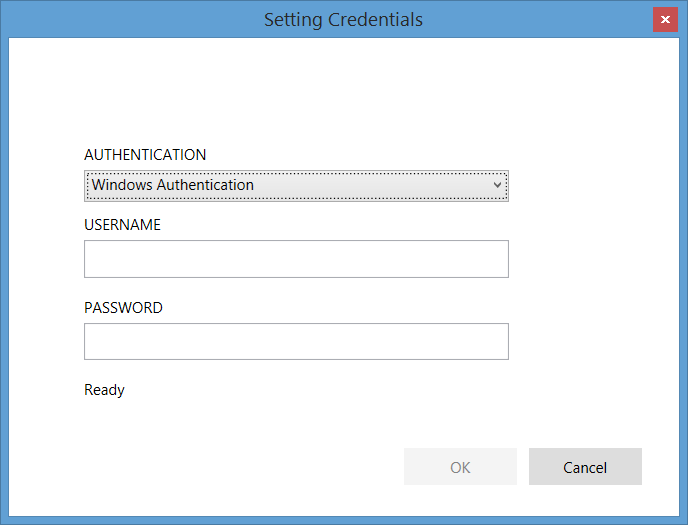 When you use the Setting Credentials application, the portal encrypts the credentials with the certificate specified in the Certificate tab of the Gateway Configuration Manager on the gateway machine. If you are looking for an API-based approach for encrypting the credentials, you can use the New-AzDataFactoryEncryptValue PowerShell cmdlet to encrypt credentials. The cmdlet uses the certificate that gateway is configured to use to encrypt the credentials. You add encrypted credentials to the EncryptedCredential element of the connectionString in the JSON. You use the JSON with the New-AzDataFactoryLinkedService cmdlet or in the Data Factory Editor. There is one more approach for setting credentials using Data Factory Editor. If you create a SQL Server linked service by using the editor and you enter credentials in plain text, the credentials are encrypted using a certificate that the Data Factory service owns. It does NOT use the certificate that gateway is configured to use. While this approach might be a little faster in some cases, it is less secure. Therefore, we recommend that you follow this approach only for development/testing purposes. This section describes how to create and register a gateway using Azure PowerShell cmdlets. Launch Azure PowerShell in administrator mode. Log in to your Azure account by running the following command and entering your Azure credentials. In Azure PowerShell, switch to the folder: C:\Program Files\Microsoft Data Management Gateway\2.0\PowerShellScript\. Run RegisterGateway.ps1 associated with the local variable $Key as shown in the following command. This script registers the client agent installed on your machine with the logical gateway you create earlier. You can use the Get-AzDataFactoryGateway cmdlet to get the list of Gateways in your data factory. When the Status shows online, it means your gateway is ready to use. You can remove a gateway using the Remove-AzDataFactoryGateway cmdlet and update description for a gateway using the Set-AzDataFactoryGateway cmdlets. For syntax and other details about these cmdlets, see Data Factory Cmdlet Reference. See Move data between on-premises and cloud data stores article. In the walkthrough, you create a pipeline that uses the gateway to move data from an on-premises SQL Server database to an Azure blob.